Adjusting to change has never been easier! Sit-to-Stand Workstations (Electric or Manually Adjustable) are the latest innovation in ergonomic technologies that help solve a variety of issues in the workplace ranging from solving repetitive motion issues, improving productivity, to meeting environmental responsibility needs. With the push of a button, go from a seated to standing posture instantaneously. The entire worksurface and all of its contents are elevated to enhance comfort and productivity. These high performance level “Adaptive Ergonomic” Adjustable Workstations are ideal for office or home office environments looking to support a diverse workforce, reduce injury, plan space efficiently, reduce footprint, or meet GreenGuard and LEED standards. Companies today acknowledge that their workplaces must support a diverse workforce. It’s not just gender, height, and body size differences. The workforce demographic is broad and the types of office tasks range widely. These carefully-designed ergonomic office workstations can raise the comfort and productivity of all employees whether in the 5th or 95th percentile. Certain workstations even exceed the BIFMA G-1 ergonomic standard by meeting the seating requirements of a 5th percentile adult female, along with exceeding the standing height for a 95th percentile adult male. Studies show that the ability to change from a seated to a standing position throughout the workday can reduce employee discomfort and risk of Repetitive Strain Injuries. The best companies, whether small, mid-sized or large are keenly focused on attracting and retaining top talent. A comprehensive ergonomics program that includes thought-out tools like adjustable height workstations, ergonomic office chairs and other adjustable desktop accessories including monitor arms and keyboard-mouse systems convey to workers that companies care and are invested in their well-being. Companies are striving to optimize the way workers collaborate and innovate and that includes how workspaces are configured. Incorporating height adjustability as a part of a dynamic space plan gives infinite flexibility and savings. 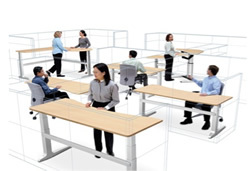 The ability to tailor to different heights is already built-in to these workstations, along with other features including fast and quiet adjustability, memory settings, under-worksurface clearance, and even workcenters on casters - all of which offer each individual to immediately adapt to their new space. Real estate costs put continued pressure on companies to reduce office space. Typical office re-stacks result in 10-20% space reductions. Computer work tools like LCD screens are sleeker and flatter and mobile devices are smaller. With new office layouts that use storage walls and consolidated storage systems, adjustable height workcenters in various shapes and sizes are critical components to leverage usability and flexibility in reduced spaces. Studies show that there is an outstanding multiplicity effect, in addition to productivity increases, when sit-to-stand workcenters are introduced in the workplace . Our bodies tell us to move as circulation decreases after sitting in a static position for long periods. Having an adjustable height workcenter helps each worker stay on task longer with less “downtime” and productivity has been shown to improve by as much as 7.5%. Reduce, recycle, and reuse! These workstations are fully complete with a worksurface, or as a base only for retrofitting with existing tops. This can result in significant reductions in raw material use. 100% of the adjustable height workcenters contain recycled materials. The laminate tops are constructed of CARB certified formaldehyde free core material that is made from 100% recycled wood fibers. In addition, they are GREEN GUARD certified and are bonded permanently to the cores using water based VOC free adhesives ensuring there is no “out-gassing”, for a clean VOC free environment both in manufacturing and office space. The metals used to manufacture the leg, feet, and brackets contain as much as 50% recycled materials, and these metals are fully recyclable at end of useful life. These workstations are LEED-ing the way! The LEED program of the USGBC is a modern revolution supporting the greening of Americas office spaces. Some of these adjustable height workcenters contribute to the ability to gain valuable LEED certification points. You can earn up to 2 LEED credits for Material Reduction MR4.2, and possible 4 additional credits for LEED Innovation & Design ID1.1-1.4 for implementation of a comprehensive ergonomics program using health benefits of height adjustability for a reduction of risk of an ergonomic injury in the workplace. In today’s office, powers supplies are often referred to as “vampires” that are constantly drawing power. These electric sit to stand workstations feature an 01.w standby power consumption, reducing corporate utility costs and the carbon footprint for wasted power generation. They also feature standby power use reduction technology. For more information, on how to implement these new technologies into your office, contact CESSI Ergonomics at 1.800.289.ergo (3746).